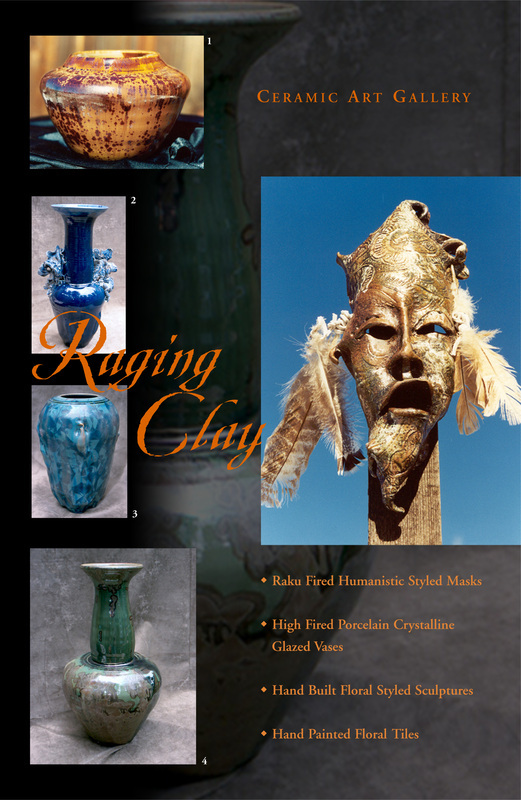 Raging Clay: Ceramic Artist: Rhonda A. Davis- Pottery, Vases, handbuilt masks, crystalline glazes and Raku. - RAGING CLAY: Rhonda Anne Davis, Ceramic Artist of 40 years. Works in Flagstaff, AZ. 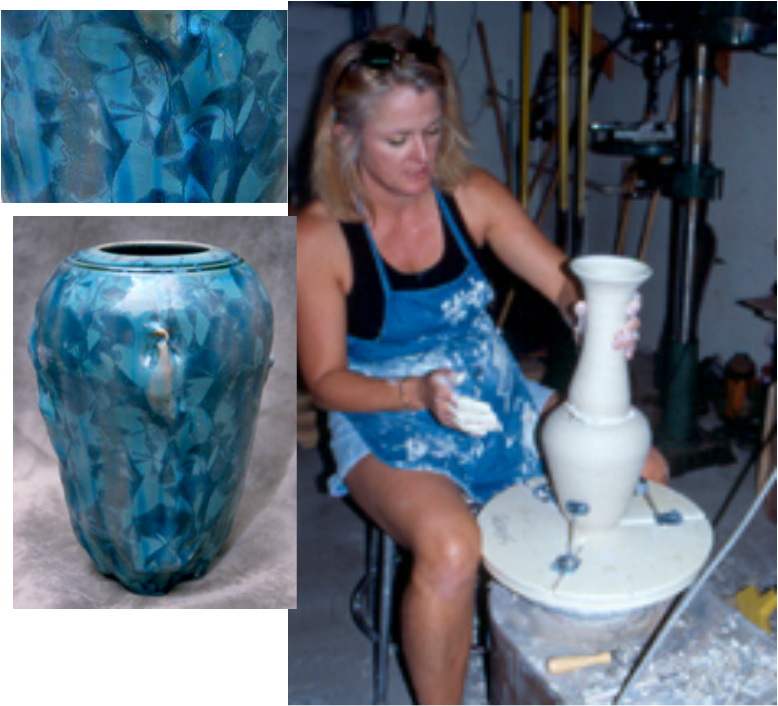 Creates vases, pottery, masks, and sculptures. 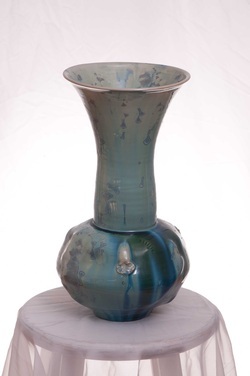 I create Crystalline glazes and Raku fired ware. 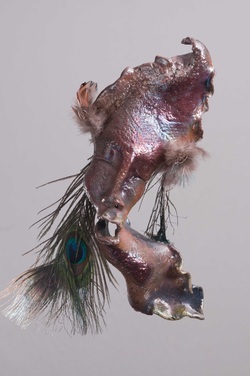 Buy one of a kind gifts, and collectables. I make work on commission.. 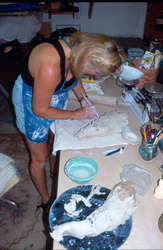 Raging Clay\ Rhonda A. Davis: Ceramic Artist. Pottery, Thrown forms, Masks, Crystal glazes, and Raku fired. We are driven as Artists to do things sometimes that are not understood. Motivations that call us to places so we can fulfill a truth. Call it the " Inner Truth Magnet". I came to Northern Arizona as a student, now I work full time as an Artist. I work with pottery shapes, that are usually altered. 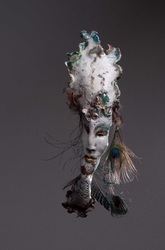 I love to use texture, leather and lace on my Masks. 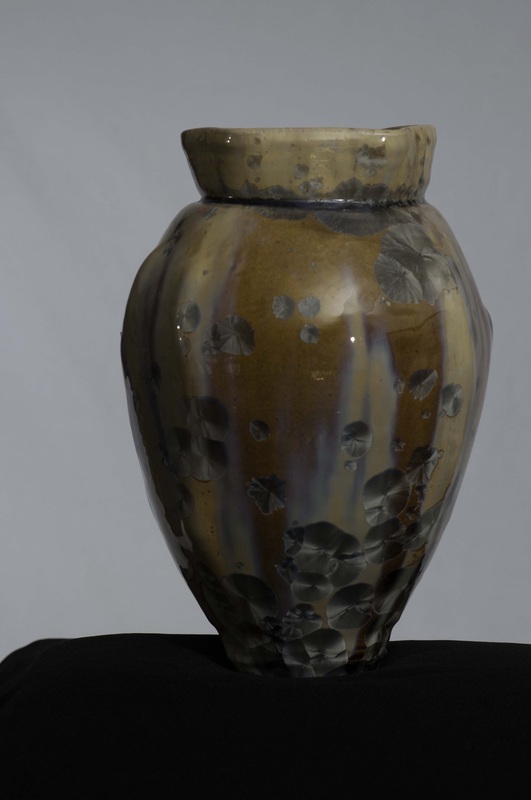 Rhonda A. Davis, a Ceramic Artist, born in 1955, is a native of Arizona. 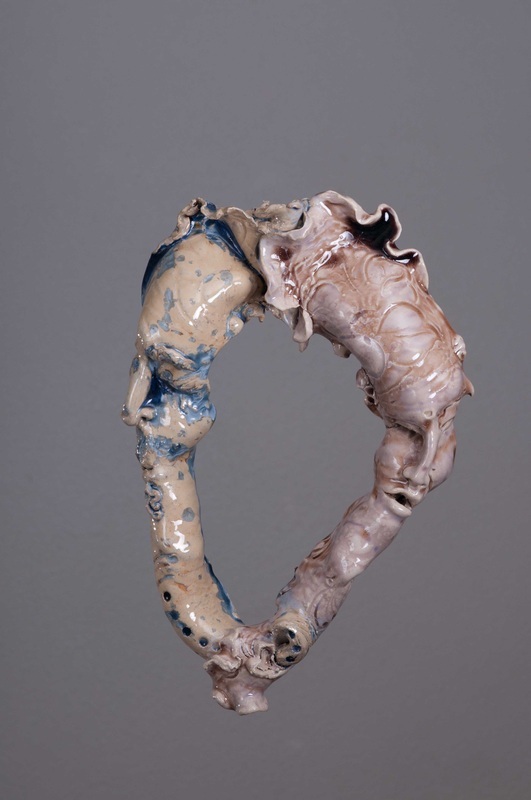 Works with porcelain, a high fired clay." 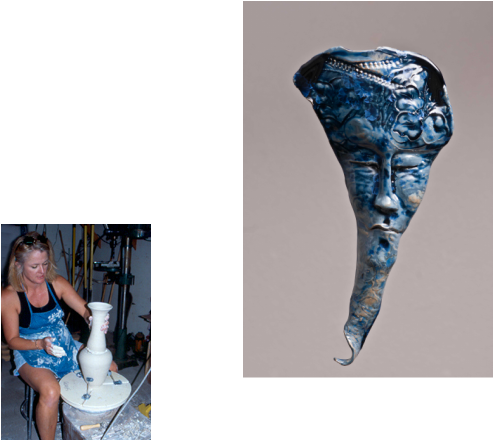 I create curvilinear vessels, and masks. My glazes are crystalline. 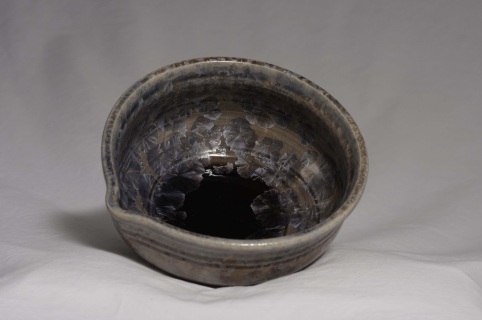 Occasionally I work with Raku firing.The subtle colors are used to enhance the forms. 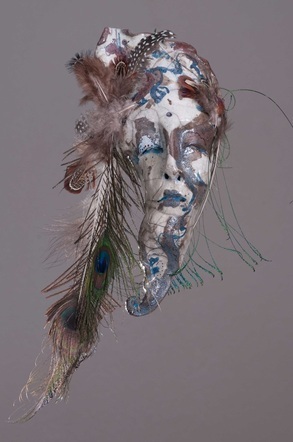 The masks are a transformation of human emotions. They go from Rage to Peaceful Meditation. Hence the name Raging Clay.
" 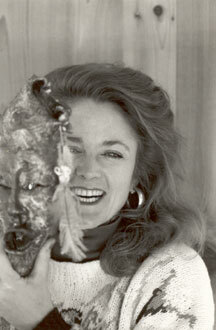 Let your inner self match your outer self"
I began making the style of masks I handbuild today in 1990. 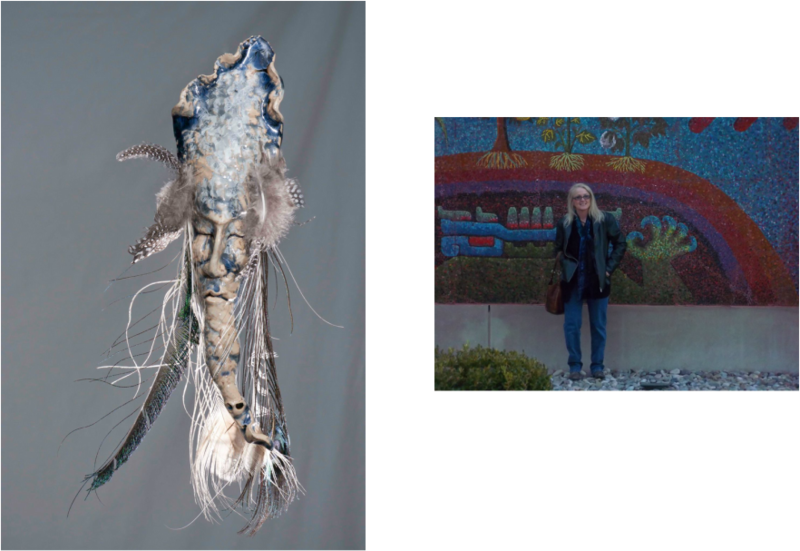 They have trasformed from Raging faces to Peaceful Shamans. 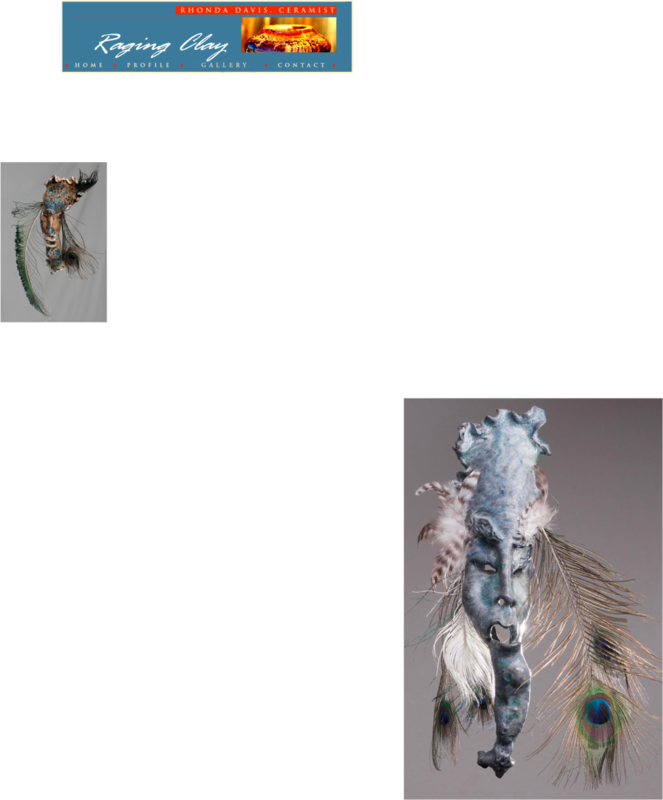 "Broken Boat Blues" $120.00 " 13"x6"
"Solar Flares" $ 89.00 12"x5"
Raku fired mask, with added feathers. " Solar Flares" 12"x5"
Crystalline Glazed high fired porcelain. 16"x 8" $150.00. Each load of pots are unique! 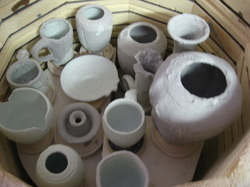 An unfired load of crystalline glazed pots.